In other words, when things go right: You feel happy. But when things go wrong: You feel frustration, regret and yes…often disappointment. The crushing, emotional blows of disappointment: are exacerbated when you are disappointed by someone who you trust and expect to give you what you want. Constant disappointment with a loved one can lead to blame, resentment, and eventually even rage. So…what is this emotion we call “disappointment”? 1. … the psychological reaction to an outcome that does not match up to expectations. The greater the disparity, the greater the disappointment. 2. … a way in which sadness is experienced. 3. … the experience you feel when you consider what might have been, in contrast to what exists in the present. 4. …what comes with finality– the recognition that you don’t have, didn’t get, or will never achieve whatever it is that you wanted. 5. …the acceptance of reality. It forces you to admit that you did not get what you wished to have, and it is actually easier for you to protest with anger than it is to encounter your sadness about the course of events. Anger allows you to continue idealizing what could have been while consciously denigrating it, and people will hang onto it only because it’s what they needed at the time. An Empirical sports analogy: In a study of long-suffering baseball fans, older fans were less subject to the disappointment effect. In other words, the longer you’ve experienced a winning drought, the better able you are to manage your expectations and take your team’s losses in stride. Source: Rainey, D. W., Larsen, J., & Yost, J. H. (2009). Disappointment theory and disappointment among baseball fans. Journal of Sport Behavior, 32(3), 339-356.Rainey, D. W., Yost, J. H., & Larsen, J. (2011). Disappointment theory and disappointment among football fans. Journal of Sport Behavior, 34(2), 175-187. An emotional state of anger towards you, another person or sometimes towards the whole world. You don’t care about anything and you don’t want to do anything. A state in which you are sad and feel that you cannot enjoy anything because your situation is so difficult and unpleasant. Present and future look so dark and obscure resulting in suspicions and fears suppressing the pleasure from the usual simple things. Bad mood and lack of mood at all are the slighter forms of apathy and depression. You know that something has just gone through your mind but can not recollect it. Feeling you are good for nothing and can’t do anything of true value. You are easily annoyed and feel irritated by everything and by everybody. It is the state of feeling rather sad because something has not happened or something is not as good as you hoped. This is the unhappiness because you do not have any friends or do not have anyone to talk to. .
You keep thinking about problems of yours or about problems that might happen; you feel scared with no specific or direct threat. Feeling hot or cold, irrespective of what the temperature of the air is. The state of guts is painful and often causes diarrhea as a result of stress. Sweating for no apparent reason even if it is cold. It starts from palms and armpits and can show up on face and the whole body. You constantly want to vomit and often do not want to eat. Tiredness is natural consequence of long working hours or conflicts and is one of the most common physical effects of stress. 1. When we are excited by our expectations our brain releases a chemical called serotonin, which is a ‘feel-good’ neurotransmitter. It interacts with adrenaline (the hormone released from the adrenal medulla), and the sympathetic nervous system, which makes the heart race, pulse quicken, and eyes sparkle. Dopamine, norepinephrine and serotonin combine to produce feelings of excitement. 2. When we are extremely stressed, fearful or angry the sympathetic nervous system is also triggered and this, of course, has the similar physical effects of the heart racing and pulse quickening, but this effect is commonly known as the ‘fight-or-flight’ syndrome. 3. Disappointment is an emotion that stimulates the parasympathetic nervous system. A chemical response is triggered which results in melancholy, inertia, and a feeling of hopelessness. If there is a prolonged ‘roller coaster’ of emotions excitement/stress, followed by melancholy/inertia, serious stress-induced disease may occur. These may include heart disease, digestive disorders, and depressed immune system. 4. Within the brain’s limbic system, when the neural transmitter dopamine, a chemical, reaches the frontal cortex, we experience pleasure. The strength of the dopamine secretion increases in anticipation of a reward; BUT withhold the reward (after the anticipation) and the strength of the secretion decreases. 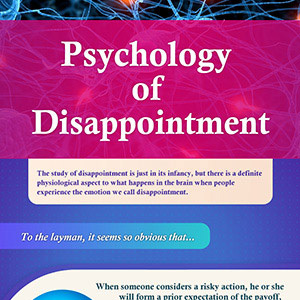 This may be the physiology behind the emotion we call disappointment. 1. EEG recordings of participants subjected to disappointment suggests that people differ in their neural responses when thing don’t go their way. The Dopamine effect? 2. Psychologically, disappointment breeds more pessimism among those already low in disappointment tolerance. The more let down someone feels, the more the expectation that the future will yield more letdowns. After a disappointing setback, decisions are made more impulsively. Achieving your goals is the best way to avoid disappointment. But, when those goals are out of reach, psychologists say these six steps will help effectively manage feelings. 1. Revise expectations: Try a bit of “retroactive pessimism.” Social psychologists have identified what they call a “hindsight bias” in which you can limit their disappointment by revising the high expectations you once had for winning. Tell yourself you didn’t really expect to win, and as time goes by, the new memory will replace the painful, original memory. 2. Increase your disappointment tolerance. There’s no reason that people low in disappointment tolerance have to remain that way forever. Don’t let disappointment breed pessimism because if you do, you’re likely to set yourself up for even more disappointment in the future. 3. Don’t let disappointment skew economic decisions. When feeling disappointed, a person is more likely to sell at a loss. If your favorite sports team lost the championship, don’t rush to dump your treasure chest full of memorabilia onto eBay. 4. Assess a person’s role in personal disappointments. People can control many of the outcomes in their personal lives. If someone’s expectations in love and work chronically fail to materialize, make an honest appraisal of what needs to be changed. 5. Control identification with a losing cause. The sports fans who feel the most let down are the ones who identify most strongly with their teams. There’s nothing wrong with being loyal, but if it impairs a person’s daily happiness, he or she needs to find other ways to boost their spirits. 6. Use humor to boost the disappointment emotion. Loyal sports fans who retain their loyalty despite years of disappointing outcomes almost seem to relish their identification with the underdog. Perhaps by joining the ranks of fellow sufferers, a person can find solace in self-deprecating humor. Laughter is truly one of the best coping strategies for dealing with disappointments, and s offset the consequences of faulty pessimism-based decisions. 1. Provides information about the way we view ourselves, the world, and others. 2. Helps you better understand what is important to you, if you examine the cause of the disappointment. In other words, we can find insight and wisdom from our encounters with disappointment when we look beneath the surface.